A serial burglar allegedly responsible for a west-end crime spree is facing dozens of charges after an angry tenant trapped him in an underground parking garage. Windsor police said Tuesday they are still seeking a second person for the break-ins to several cars and an apartment building in the 1700 block of University Avenue. Building owner Keith Pickard said he got so fed up with the ongoing thefts that he posted surveillance photos of the culprits on street light poles and online. George Liscombe, 45, of Windsor, is charged with 10 counts of mischief, seven counts of theft, two counts of break and enter, two counts of possession of stolen property and two counts of possession of break and enter tools. Police said his accomplice was a white man with a medium build. He was wearing a brown leather coat, black knit hat, gloves, dark pants and a black scarf over his face. Officers were called to the building in the 1700 block of University Avenue West at 7:30 a.m. on Jan. 19. Two people had broken into the apartment, then smashed the windows in nine cars and took what they could. Surveillance video obtained by The Star shows two people forcing their way through the building’s front door by prying open the lock. 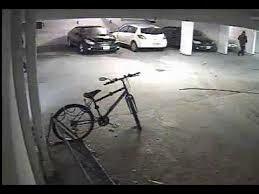 After making their way into the parking garage, they go from car to car smashing windows and stealing things. One person often appears to stand lookout while the other breaks into vehicles.